Long distance travelling would have to be one of the most monotonous parts of any long-term travel experience. Of course you’ll want to check out the scenery as you move from place to place but after day upon day sitting cramped on buses and trains, intercity travel can really grind your gears. The last few weeks of our European summer exploration involved a lot of long distance travel – how did we overcome the boredom factor? We tried to combine travel days with activities so we had something concrete to look forward to and it really did help. Not only did we avoid sitting on buses all day but we got to enjoy some awesome sightseeing and activities (like the Plitvice Lakes and Krka National Park) and saved the need to double back after an activity which resulted in less time wasted getting from A to B. Imagine our excitement when we stumbled across Raft Kor – not only were they able to get us from one location to another but they promised a fun day on the Neretva River in the process! We arranged a pick-up time from our accommodation in Mostar where Sanel, the owner of Raft Kor promptly picked us (and our gear up). We hit the road, headed for our first stop – breakfast! After meeting the rest of the crew over a tasty meal, we made our way over to the Raft Kor base to get kitted up ready for our rafting adventure. The Neretva River is absolutely breathtaking and over the course of the day you’ll drift, raft and swim your way down 25km of pristine Bosnian waterway. 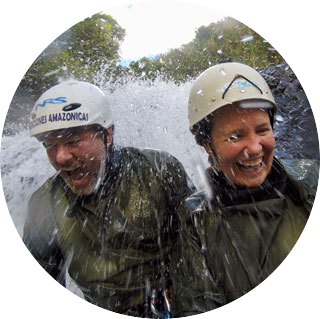 The rafting itself is not challenging and is ideally suited for first-time rafters, those less confident in water and even children – a couple of the rapids will get your heart pumping but the day is more of a relaxing day in a beautiful setting than an adrenaline inducing challenge. After drifting down the river for a few hours, we pulled the raft onto a little pebbled bank where our hosts whipped up a traditional Bosnian barbeque for us. Ćevapi (a freshly smoked sausage) was served up in a peta bread with lots of tomato and onion on hand for those that wanted them. After washing everything down with some fizzy and cooling off with a swim (it certainly was cool in the river!) it was time to make a move again. The rest of the afternoon was spent meandering down the river with the occasional rapid thrown in, with stops along the way to fill up our water bottles (with the freshest water imaginable) and jump off the odd rock (to appeal to those of us wanting a bit more adventure). We had a fantastic day out on the water – both the scenery and weather were stunning and the company was great which made it totally worth braving the chilly water. The rafting is well priced and offers excellent value for money considering the length of time you’re on the water and though the river itself isn’t particularly suited to adrenaline junkies, who doesn’t enjoy getting out amongst a beautiful setting, soaking up the sun and breathing in the fresh air? If you’re needing transport to get between Mostar and Sarajevo (or need to do the trip in reverse), we’d definitely recommend joining Raft Kor – you’ll enjoy a relaxed day out on the water which without doubt, beats a straight bus trip from one town to the next! Headed to Bosnia? Pin this post for future reference! Thank you to Raft Kor for having us along as their guests for the purpose of this review. As always, all thoughts are our own. PS: The driving throughout this part of Europe may be different to what you’re used to at home – drivers often talk on cellphones and following distances can be fairly close. Try to sit back and relax. Remember, they’re used to these conditions – slap your seatbelt on and enjoy the beautiful scenery. PPS: Bosnia and Herzegovina are out-of-this-world amazing – get yourself there ASAP. This entry was posted in Activities, Adventure, Bosnia and Herzegovina, Europe, Mostar, Sarajevo and tagged review, transport. Sounds like such an adventure! Love the photos.